Overview - Director Rob Reiner (When Harry Met Sally) and screenwriter Aaron Sorkin (The Social Network) have crafted this romantic comedy about the relationship that blooms between environmental lobbyist Sydney Ellen Wade (Annette Bening, American Beauty) and Andrew Shepherd (Michael Douglas, Wall Street), the President of the United States. Smitten with one another, Wade and Shepherd want to pursue something deeper, much to the chagrin of the President's loyal Chief of Staff (Martin Sheen, Apocalypse Now), but the two lovers find their connection strained by both global political issues and the machinations of the presumptive Republican Presidential nominee (Richard Dreyfuss, Jaws). We all need a little romance in our lives, even the most powerful man in the free world. Pulling back the curtain on the commander-in-chief's private life, 'The American President' weaves an unconventional love story that's filled with wit, heart, and politics. Though a bit idealistic, Sorkin's script is smart, and Reiner's direction is strong. With a great ensemble led by Michael Douglas, the movie remains entertaining, even despite a few notable flaws. When widower President Andrew Shepherd (Michael Douglas) meets environmental lobbyist Sydney Ellen Wade (Annette Bening), he is instantly smitten. Unfortunately, for the President, the dating world can be complicated, and his attempts at courtship become instant fodder for the press. As the two fall in love, the world watches with skepticism and uncertainty, and the President's political opponents launch an unsavory smear campaign. With his loyalties torn between his heart, country, and ambitions, the President will have to find a way to balance love and politics, or risk not only losing his storybook romance, but his reelection as well. As they proved with their previous collaboration, 'A Few Good Men,' Rob Reiner and Aaron Sorkin make a good filmmaking pair. Together they craft a sweet, entertaining romantic comedy that harkens back to an innocent, Capra-esque sensibility. Indeed, at times the movie has an almost fairy tale quality to it, placing a presidential spin on the classic genre. The castle is traded in for the White House, the king for commander-in-chief, and the fair maiden for… a lobbyist. Come to think of it, the film may have even more in common with fantasy than I thought. A lobbyist dating a president? Why, that's like a vampire dating a werewolf. Kidding aside, the movie does have a kind of idealistic whimsy, and for the most part, this works fairly well. It's not all fun and games though, and the pair's fairy tale romance does lead to real drama. Sorkin examines the hectic, stressful realities of the Presidency well, and litters the screen with his trademark, rapid-fire dialogue. Characters are constantly on the move, walking and talking (another common "Sorkinism") and Reiner maintains a great sense of movement and momentum throughout the dialogue heavy presentation. The personal and political dilemmas that Shepherd faces are interesting, providing a multifaceted peek into the private and professional life of the President. As the scandal heats up and political maneuverings become more involved, the script presents a decent, albeit simplistic overview of White House strategy and the sometimes ugly nature of campaigning and press coverage. Essentially the prototype for Sorkin's acclaimed television series, 'The West Wing,' the film shares many similarities with that later work (apparently early episodes of that show actually feature bits excised from the film's original script). Hell, a decent chunk of the cast even make appearances here. In addition to Sorkin's witty dialogue, the film also features a slightly screwball sense of humor. The White House staff's bemused reactions to the President's relationship are quite amusing, and the juxtaposition of typical rom-com scenarios with the inherent gravitas of the Presidency leads to some decent laughs. In fact, most of the funniest moments come from President Shepherd's attempts at everyday romantic gestures, including a particularly entertaining scene where he tries to personally order a bouquet of flowers. It seems like a simple task, but for the President, it's anything but. The cast is uniformly strong, and Douglas in particular is great as the commander-in-chief. The actor exudes confidence and control, but still projects an approachable and relatively easy going demeanor. One of the film's major subplots involves the President's reluctance to fight back against various attacks on his character. Wishing to be the bigger man, he takes it all in stride, but eventually reaches his boiling point. Douglas rises to the occasion masterfully, delivering a commanding and stirring speech during the film's climax. While 'The American President' is definitely an above average romantic comedy, the film is not without some notable flaws. Sorkin's idealistic vision of the White House can be unrealistic and naive at times, and the script's heavy liberal leanings can be excessive. Some of the political discussion is also quite simplistic, and many of the movie's once biting observations and verbal spars no longer feel as sharp as they did back in 1995. Likewise, the whole affair can get a little too "cute" at times. Thankfully, the main emphasis here isn't on the actual politics, but the romance itself, and Sorkin does inject potent hints of cynicism to counteract the occasionally sappy qualities of the story. Fueled by a soaring, idealistic bravado and classic screwball charm, 'The American President' is an entertaining, old fashioned romance with a contemporary edge. Sorkin's script features sharp dialogue and interesting characters, and Reiner does a nice job of maintaining a sweet, faintly Capra-esque tone. The performances are all great, and while the film's view on politics is a little naive and simplistic, there is some real drama here, and even a few thought provoking observations. It's not the best work that Sorkin or Reiner have to offer, but it's certainly a very solid effort that has managed to age pretty well. 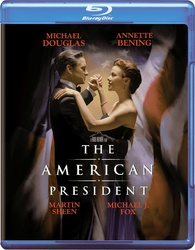 Warner Brothers brings 'The American President' to Blu-ray on a BD-25 disc. After some warnings and logos, the disc transitions to a standard menu. The movie is provided with a 1080p/AVC MPEG-4 transfer in the 2.40:1 aspect ratio. Serviceable but a little problematic, 'The American President' makes its high-def debut with a seemingly dated transfer. The source print is in great shape with no real signs of damage. A very light layer of grain is visible, but can look a little noisy or alternately digitally scrubbed in spots. Clarity can be solid, but wide shots (and even some close-ups) are soft, lacking fine details and textures. Colors are decent, with some richly saturated reds and blues, but the majority of the presentation lacks pop and dimension. Contrast is evenly balanced, and black levels are consistent. Light edge enhancement is visible in some shots, and the picture has a faintly processed look to it. Decent but underwhelming, the transfer shows clear room for improvement. Some of the picture's less than stellar attributes may simply be inherent to the original photography, but the image does have an occasionally artificial quality. The film is provided with an English DTS-HD MA 5.1 track and a Spanish Dolby Digital 1.0 track. English SDH, Spanish, and French subtitles are also available. With a very tiny soundfield, the movie lacks any real sense of immersion. Speech is clean, crisp, and well prioritized, giving Sorkin's trademark dialogue ample room to breathe. Likewise, Marc Shaiman's stirring score comes through with strong fidelity, and is spread nicely around the room, letting the movie's memorable theme soar. Unfortunately, that's pretty much all the track has to offer. Outside of dialogue and music, effects work is sparse, and there is only a very minimal sense of ambiance. Even the front soundstage is surprisingly subdued, doing little to bolster the seemingly hectic and lively atmosphere of the White House. Some brief instances of directionality and surround activity crop up (a helicopter panning form the rears to the front, for instance) but these occurrences are so rare that they actually tend to stick out when they happen. Dynamic range is on the flat side, and bass activity is negligible. The mix is free of any major technical issues, but the track is disappointingly basic. Fans should still be satisfied with the audio, but it's a comparatively mediocre effort. Theatrical Trailer (SD, 3 min) - The film's theatrical trailer is included with Dolby Digital 2.0 sound. 'The American President' is a smart, sweet, and funny romantic comedy from Rob Reiner and Aaron Sorkin. Some of the scripting can be a bit idealistic, but the film has an old-fashioned charm that works well. Unfortunately, the video transfer is seemingly dated, and while serviceable, it's not ideal. The audio is also pretty average, but gets the job done. Disappointingly, this is a barebones release. While not a classic, the film deserves better than this, and as it stands, this is a mediocre catalog release that will only appeal to fans.